I’ve recently decided to invest more time in reading and learning but for this I need books, right? Lots of them! I was never really pro electronic book readers because I always preferred holding real paper books in my hands. Just call me old-fashioned. But I was sick and tired of waiting for my orders and getting angry about DHL messing up the delivery. The idea of having a book in 60 seconds delivered to me via wireless internet was quite tempting. So after browsing the internet about what’s best on the market, I’ve narrowed my choice down to two gadgets: the iPad and the new Kindle 3. Unfortunately, my budget didn’t exactly allow me to invest into an extremely expensive iPad. The starting price is 499 euros and I’m not sure if it’s worth that much. So I was basically left with the one and only possibility: the Kindle. My first impression was that’s it’s small! Very small! And so light! It looks pretty, curvy and elegant, doesn’t it? I was positively impressed by it but this changed as soon as it was charged and turned on. I was disappointed to notice that the 3G connection is not working for me here in Germany. When I tried to connect to twitter or use the browser to open any page, I got this error: "due to restrictions web browsing is not available for all countries". What?!?!?! I couldn’t believe my eyes! Blogs, social networking features, & the experimental web browser are not available for Germany. How? Why? This wasn’t mentioned anywhere on the Amazon site! I just don’t understand why would Amazon offer the 3G Kindle for customers from Germany, if most of the features is not available via 3G in this country? It makes no sense. … writes explicitly that 3G works globally. How can it work globally, if its usage is restricted in most of the countries outside US? This is false advertisement and it’s misleading the customers, like myself. One of the main reasons I have chosen the 3G Kindle was to use it for reading blogs and social networking. If I would’ve known this upfront, I could have saved 50$ and perhaps bought the one without 3G… or invested in the iPad! That last one probably not. 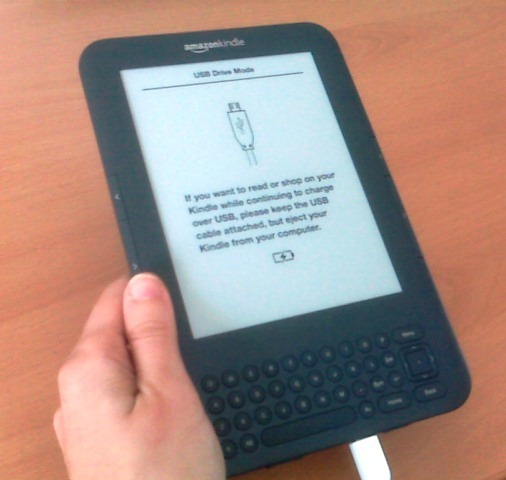 Another interesting thing is that before ordering the Kindle, the customer must select the primary country of use. Free 3G wireless lets you download books right from your Kindle. No monthly fees, service plans, or hunting for Wi-Fi hotspots. OK, I can download books, that’s good. But why don’t you state that I can’t do anything else via 3G?!?! 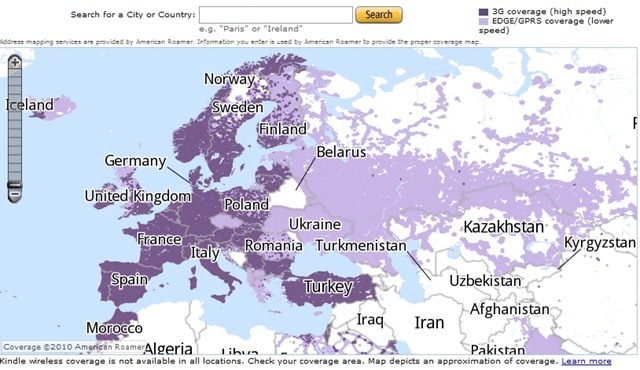 So if there is 3G coverage, why did they restrict the functionalities for the European customers? I’m apologize for any misunderstanding caused. Internet access using the Web Browser through Whispernet is not available in most countries outside the United States when using your Kindle’s 3G connection, however most customers can access Wikipedia. These restrictions do not apply when accessing the Web Browser over a Wi-Fi connection. 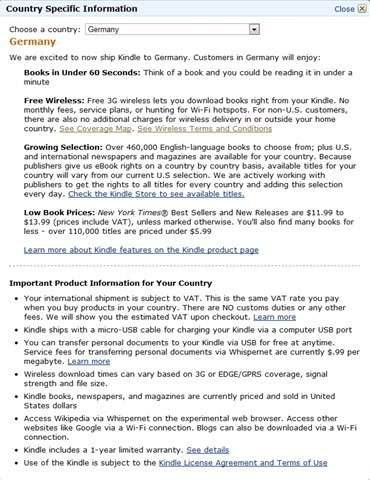 You’ll find helpful information on our Using Kindle If You Live Outside the United States Help page (http://www.amazon.com/kindleinternationalsupport). Did this answer solve my problem? Hell no! So I wrote to them demanding that they update the coverage and internet access information via 3G for the new customers to know what the real deal is. I am a regular and satisfied customer of Amazon but, let me tell you, I feel really deceived by them at the current moment. Anyhow… despite all of this, I think I will keep the Kindle. It’s a nice little gadget. I wanted it mainly for reading books and I’ve always ordered my paper books from Amazon so it will be enough for that. The experimental web browser is a nice-to-have feature and it works when connected to a WIFI. There are no restrictions. I actually won’t use the browser so much because 1.) the screen is black and white and 2.) I’m not focusing on reading if I can surf around. This second reason was also why I didn’t want to buy the iPad (besides the outrageous price). Finally, I do hope that Amazon will inform their customers better about these restrictions in the near future. I’m sure that there are some customer protections laws which forbid them to do such things. So someone who is not as nice as me will report them and slap them with a very expensive lawsuit. But if they will not update their website, I do hope someone will teach them a lesson! Thanks for writing about the functionality of the experimental web browser in Germany. The last response you got was correct, and at this current time it would appear that the information you were able to track down is the most up to date information available on this topic. I understand that his is not an answer that will give you the information you seek, but I’d like to thank you for bringing this to our attention. Global Kindle Free 3G Web Browsing: Where? That’s mine and I found (and show) that Amazon UK has a listing of countries where 3G webbrowsing is officially enabled for residents in those countries. Germany’s not listed, nor is France and a few other European countries where 3G rates may be too high for Agreements to have been made with Amazon. You can actually use your 3g web browser if visiting a country where it IS enabled for residents, per people writing in the UK Amazon forums, at least, from their experience and it’s been a consolation of a sort to those who have found they can do that..
Also, wanted to say that when you choose your country as you have shown, in a clear way, that Wikipedia is available via 3G in addition to normal 3G Amazon book downloads. They do need to change the main international page to caution people that 3g web browsing beyond Wikipedia is not available in many areas (this will be due to inability to negotiate good rates with regional 3g carriers, for them to support it for us at no added cost)..
After I purchased the Kindle and noticed that the 3G surfing is restricted in Germany, I started to search on the web and came across your post. But I’ve ordered from amazon.com so I did not see the list of countries on Amazon UK. This list is not on amazon.com. There is actually no information on that site that 3G usage is restricted so I was led to believe that I will have full access. I actually use the Kindle for reading only and surf seldomly via WIFI but the only thing that bothered me was that when I ordered the Kindle, I wasn’t informed that the 3G in Germany is limited to Wikipedia only. I expected more from Amazon. Your post helped me figure it out so thank you. This is why I added it in the related links so that others can read it too. I think Amazon U.S. should post the same information. For some reason they show no interest in doing that, but I think it’s because they’re involved in negotiations with those carriers. I hope you’ll enjoy the Kindle despite all this. From all you say, you will. Hello, i just read your post, and after sending an inquiry to Amazon i got THE SAME canned answers as you did. I’m very dissapointed because the product’s advertisement is truly misleading and as the date of your post, it seems that browsing with Kindle on our countries (I’m from Spain) will stay experimentally unavailable indefinitely. I think they owe me 50 bucks. yeah.. the same thing for me. I am currently living in Germany so I bought my kindle from Amazon.de but one day I am going back to latin america. Hope 3G works there, or that my Kindle works at all. While in Germany, I tried to buy an e-book from Amazon.de. NO GO…. I even tried to establish a new address in Germany (in answer to “Have you relocated recently?” NO GO. Either the site id’s my device, or my credit card, as American and refuses to allow the transaction. Some gobbeldy-gook about international restrictions. I don’t believe amazon on this one – they are playing the “used car salesman” game.